On going to university, young people are suddenly faced with newly found independence, increased responsibilities, and a whole host of new experiences. How they respond to these challenges is critical for their wellbeing and future prospects. Despite how serious this phase is, as parents, teachers, and wider society, we do little if anything to prepare them for this challenge. While studying, I witnessed this paradox firsthand through my own and other students’ experiences. 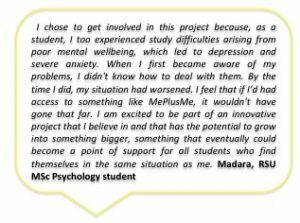 This is why, eight years ago during the final year of my doctorate degree in Clinical Psychology, I conceived the idea of developing an easily accessible system available to university students who want to learn how to take care of their mental health and stay on top of their studies. I later named this system, MePlusMe. I designed MePlusMe so that students can use it at any time they want and get tailored advice about the specific needs they have at that time. 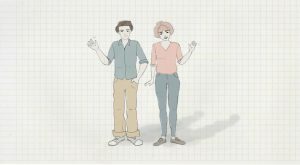 The advice is in the form of psychological and educational techniques presented as a package of animated videos. Students can watch the videos at their own pace and apply each technique when they need it. This process doesn’t just offer at their fingertips support when need, but over time it equips students with the skills to address any challenges they face more effectively. As a result, young people’s self-efficacy is enhanced and, with their engagement, they invest in their long-term wellbeing and future prospects. Until health policies and services catch up and we can provide a more systematic approach to promoting mental health on a wider scale, our young people should not fail to fulfil their potential simply because we fail to prepare and equip them adequately for university. The development of MePlusMe is gradual because I am following the Medical Research Council guidelines for developing complex interventions. So far, my team and I have carried out two market research projects (one with university counselors and the other one with students), a proof of concept study, and an explorative feasibility study of the system’s content. 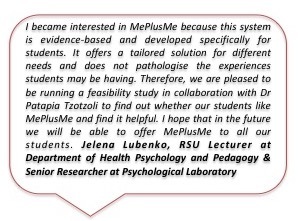 In October 2018, we set up a larger feasibility study to assess MePlusMe’s design and content with Riga Stradins University (RSU). 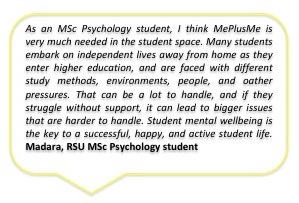 Therefore, for a limited period, RSU students have the unique opportunity to see the system in its current form, and to take away a personalized package with psychological and study skills video techniques that can support them throughout their studies. The aim is to find out if they like the system and explore any aftereffects from their engagement with the video techniques over a period of two months. This study wouldn’t have been possible without the unlimited support and enthusiasm of Dr Jelena Lubenko, a lecturer and senior researcher at the RSU and her four talented students who have chosen to carry out this study and report findings on their respective MSc theses. We will reach an important milestone at the end of this study because its results will provide evidence about the need for the system and its practical value. The findings will support the progress of MePlusMe’s full development so that in due course it can be integrated within universities and become available to all students. If you would like to find out more about this topic contact My Psychology Clinic.